Grin and BEAR "I.T." | Picasa and Google Apps – Me likey! Picasa and Google Apps – Me likey! I decided to create a little blogpost about my first encounter with Picasa within my Google Apps domain and share some advantages of the application. 2. What I also noted, was that we can tag people within albums, just like facebook, and I can begin associating specific people with pictures. This is all associated with my contacts and district contact list. 3. Picasa also has some basic photo editing features too! AND I note – Picnik is now a feature and even listed as a Google App. 5. You can easily create and embed slideshow widgets based on your albums. 1. Not a long term solution as you only get a 1 gb folder. You will have to do housecleaning and teach staff/students how to conserve space by resizing images. 2. It took me a little while to figure out how to integrate the Picasa App with the Picasa Web albums. Training (or learning time) is going to be needed. 3. I havent transitioned my domain to the new Google Apps. Right now, only very few people have access to these tools (within our domain). 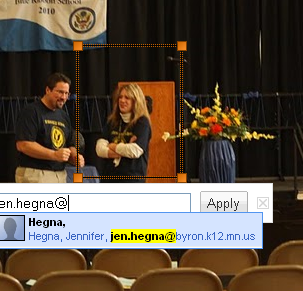 This entry was posted in Bear NewZ, google, Web 2.0 and tagged Picasa. Bookmark the permalink. I really like Picasa too. Great way to organize photos and back up work. I created a movie in Picasa of screen shots. It was easier to use then powerpoint. Saved the movie to my flash drive and did not need internet or powerpoint to show the movie during my presentation.